If you are raising chickens at home in your backyard, then it will be very important to keep them safe from chicken predators. There are various chicken predators that enjoy the taste of chicken just like we humans do. If your chicken coop is not built solidly, then it is even more necessary for you to find other ways to ensure the safety of your backyard chickens. There are a variety of chicken predators that would love to sink their claws, talons or teeth into your chickens. Predators can vary depending on where you live and what is most common in your area. If you are unsure what kinds of predators might prey on your chicken, you should have a look at the following list. Some of these may not be a problem where you live. But likely, you’ll find a few that are a problem in your area. Many dogs are certainly fond of going after chickens. Different dogs tend to react differently to chickens. Some might ignore them or even love and want to guard them. But many others are a nuisance and simply love to chase them. And even others will want to hurt your chickens seriously, and chew them up. You might not have a dog in your own house to worry about, but it’s also the neighborhood dogs that you should be concerned with, especially any stray ones that can get into your yard. Really, most domestic dogs usually kill chickens accidentally or aimlessly through rough play and do not actually want to eat the chickens. But unfortunately, you’ll never know how any dog will react until it’s too late. Even some small toy breeds, which you might think wouldn’t be a concern, have been known to be a problem for chicks or small bantam varieties of chickens. 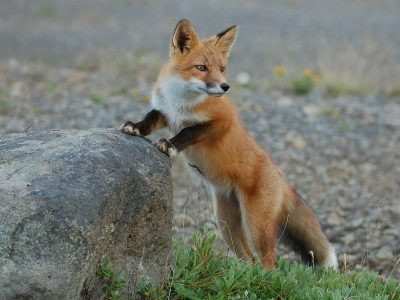 Foxes are another of the common chicken predators. They will have no trouble getting to your chickens. Before they make their strike, foxes will usually spend days to even weeks staking out your chicken coop. Foxes are born predators and chickens are among their favorite prey. When foxes break into a chicken coop, they’ve been known to kill all the chickens in the coop. Not only will foxes kill your chickens, but they will also carry away as many birds as they can with them. There’s a reason the common phrase “like a fox guarding the hen house” has come to be synonymous with someone up to no good. Hawks and eagles attack chickens for the sole purpose of eating them. The kill ratio of these birds of prey is pretty high, especially when it comes to chickens, because chickens do not look up when being cautious of danger. Hawks and eagles usually go after chickens during the day when they are free-ranging. White chickens especially tend to be in danger from these chicken predators. The darker colored chickens are a little harder for hawks and eagles to find because they don’t stand out as much, but can still be in danger. Keeping chickens in a mobile chicken tractor while they free range is a good way of protecting them from hawks and eagles. Owls, especially great horned owls, also attack chickens just like hawks and eagles. However, they prefer to hunt at night. They stake out the birds and then swoop in unexpectedly for the kill. Chickens that free range in the evenings and early mornings (or ones that are left out at night) are most in danger of being attacked by owls. Keeping your chickens in a chicken tractor or a coop with a chicken run is an ideal way of protecting them from owls and other similar birds of prey. 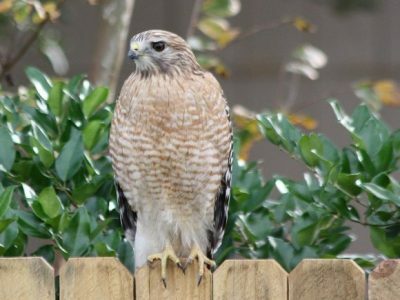 Keep in mind that killing hawks, eagles, and owls or other similar birds that might prey on your chickens is illegal because of the Migratory Bird Treaty Act. There is a reason why raccoons are known as the masked bandits. Not only do raccoons tend to be quite sly when it comes to attacking chickens but they are equally skillful burglars as well. They cleverly figure out door openings and latches. 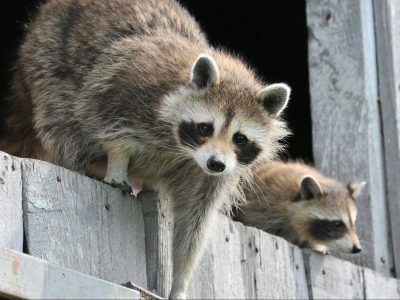 Using complicated latches or even lock and key on your chicken coop door might become necessary if you think that there are raccoons in your neighborhood. Raccoons usually kill multiple chickens, eat them and will even steal chicken eggs too. Sometimes, they even kill extra chickens just for fun, instead of only for food. Opossums are another common chicken predator. But unlike raccoons, they generally only kill chickens for food. So usually, instead of killing several chickens, they may just kill one or two. They are nocturnal and hunt at night, so you likely won’t see them. However, they are known for biting into the chicken and tearing it apart to get to the innards or biting the head off of your hen. So, you can find a bloody mess in your coop in the morning. Skunks are not too much of a serious chicken predator generally, but they can prove to be quite annoying. Skunks usually refrain from attacking adult chickens, but they sure have a lot of fun going after baby chickens or stealing the eggs your hens have laid. However, some skunks have been known to bite and kill adult chickens too. Usually, just one at a time and generally the bites are near the head. Skunks have very poor eyesight and usually they are nocturnal. If a skunk manages to find its way into your chicken coop it will most likely go after the chicken eggs first. If you have a pet cat or dog that is trained not to attack your chickens, then skunks will generally stay away. Snakes are also among the common chicken predators. Like some of the other chicken predators mentioned in this list, snakes not only attack chickens and young chicks, but they also go after the chicken eggs as well. Depending on the variety of snake, some only prefer to go for the eggs while others will only want to kill your chicks and chickens. Keeping snakes out of a chicken coop can be tricky since snakes can slip through even the tiniest crack, gap or hole. Snakes eat their food whole. So you likely won’t see any evidence except for a missing egg or missing chick. Snakes only attack during the night so keeping the chickens indoors securely in their coop during the night is the best way of protecting them from snakes and even the other chicken predators too. What can be done about chicken predators? There are a number of other predators, like bears, coyotes, or wild cats, that would also enjoy going after your chickens and enjoy a delicious meal after they are done killing them. However, mentioned here, are just some of the more common chicken predators for backyard chickens. 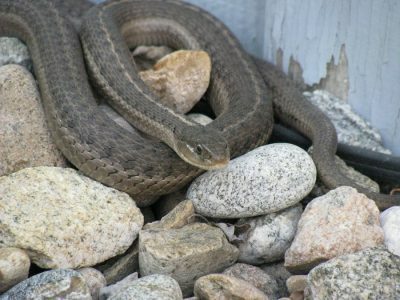 Most people, unless they live in an area known for these larger predators, shouldn’t have to worry too much about them. But for the more common chicken predators, you likely will want to take the necessary safety measures to protect your birds from them. One of the best ways to protect your backyard chickens from these common chicken predators is to be sure they are in a secure, well-built chicken coop at night time that is raised at least 1 foot off the ground. You want to be sure to patch up any holes or gaps. Having your coop inside a fenced area is another good tip. I’ve seen some people place bricks, concrete blocks, or large rocks around the edges of their coop. Burying chicken wire or hardware cloth several inches deep around the edges of the coop or run will protect your chickens from digging predators. Keeping your chickens in a chicken run or using a moveable pen or chicken tractor is safer than free ranging your chickens. If you do choose to free range, then hanging shiny, silvery items like streamers or old CD’s around your yard can help deter flying predators. Also, having places for the chickens to take cover, like bushes or benches can help some. But know if you do free range your chickens, you likely will have to plan for losing an occasional chicken here or there. 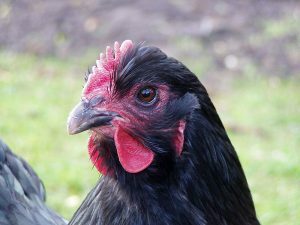 And despite dogs being listed as one of the above predators, if you have a well-trained dog that you can trust around your chickens, that can be one of the best deterrents to any of these chicken predators. 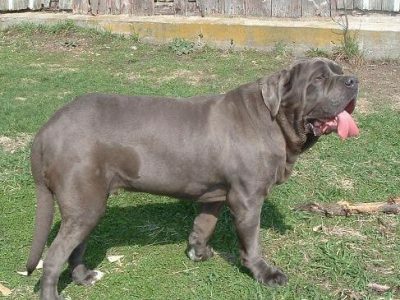 There are even some breeds of dogs, such as the Great Pyrenees, the Kuvasz, and the Anatolian Shepherd, that are bred specifically for guarding livestock.